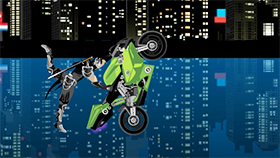 Gravity Driver is a great driving game developed by Filipe SheepWolf Games. If you like speed and deadly challenges then this is the game for you. 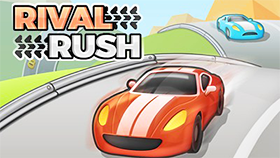 In this game, you drive a car inside a big sewer. Your task is to dodge obstacles along the way and drive your car as far as possible. Turn on the sound when playing this game because it's great. Gravity Driver brings you grueling challenges. In the sewers there are many walls blocking your way. You need to go through small spaces to cross the walls, so you have to drive your car wisely. Each time you hit a wall, the damage bar will increase (the damage bar is in the bottom left-hand corner of the screen). When the damage bar is full, you’ll lose the game. Note that you only have 60 seconds to drive your car. How far can you get in 60 seconds? Gravity Driver has 2 modes: Normal Mode and Cold Mode. However, to unlock the Cold Mode, you must beat the Normal Mode by driving 12,000 yards. Will you be able to beat this challenge? With interesting gameplay, nice effects and sound, I believe you will like this game. Now, it's time for you to experience the game for yourself. Good luck and have fun! Use the arrow keys or WASD or drive your car. 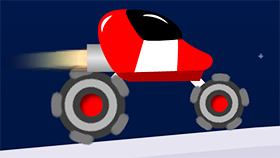 Gravity Driver Unblocked is a fun game and you can play it on freegames66. With this site, you can enjoy many quality unblocked games, all for free. Moreover, freegames66 brings you a user-friendly interface where you can play your unblocked games without any difficulty. Now, enter Gravity Driver Unblocked, maneuver your car wisely, go across walls and get as far as possible. Play now!